Looking at that movie poster, with three street-style rodents sporting hoodies and attitudes, I couldn't help but cringe. Did they really need to turn the sweet Saturday-morning chipmunks into gangsta refugees from "TRL?" Well, they didn't, as the poster reflects almost nothing about the movie. The actual film is simply an inoffensive exercise in by-the-book movie making and a masterclass in wasting comedic talent. While Lee shows a mere glimmer of what's made him a success, barely displaying the coiled-spring anger that should have sold his "Alvin!," Cross was made to play a slimeball, and he plays the role to the hilt as the bad guy here, pulling out every tactic you've ever seen from a movie businessman, in trying to take the chipmunks away from Dave. I don't have to say another word, and you've probably got the remainder of the movie plotted out in your head. Every step along the way has been done before, and to better effect, which makes it all the more painful to watch two fun actors like Lee and Cross play out the string. Lee likely did it (and Underdog) to give his kid something to watch from daddy's filmography, but Cross just seems entirely wrong for the film, considering his subversive stand-up act. I guess dissent just doesn't pay as well these days. Either appearance is more understandable than a minor cameo on the part of the hilarious Jane Lynch, who hopefully was paid very well for her minor role. This film breaks the cardinal rule of moviemaking, when it comes to remaking childhood favorites from past generations: don't focus on the kids. There should be just as much entertainment value for the adults in the audience as there is for their children. It's the reason why Shrek and the Pixar films have been so successful they know that adults will watch so-called kids movies if the story works and there are enough over-the-kids-heads winks and nods for the adults to enjoy. 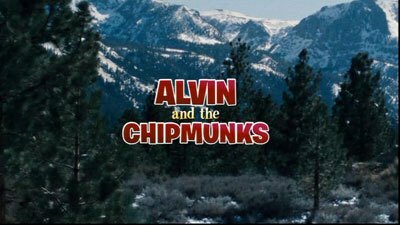 Outside of the draw of Lee and Cross, Alvin and the Chipmunks has nothing adults will find worth their time. It's as pure a "kids movie" as you could not want to see. It's not that the film is without its charms. The classic Chipmunks songs are still fun to hear (even if "Witch Doctor" received a hip new dance remix) and the computer-animated chipmunks, especially the cuddly Theodore, are absolutely adorable, striking a nice balance between realism and anthropomorphism. The filmmakers thankfully resisted the temptation to carry over the child-sized proportions of the cartoons, which would have resulted in ridiculous creatures better suited to a Jim Henson production. But no matter the look, in the end, like Lee, they are left to loiter for 90 or so minutes, without much to do, thanks to a lackluster, formulaic script. We received an early screener to review, so we can't give any idea about the packaging, but it seems to be a flipper disc, with a full-frame version on one side and widescreen on the other. Oddly, both sides have anamorphic widescreen menus, which offer options to watch the film, select scenes, adjust languages and check out special features. Audio options include English Dolby Digital 5.1, and Spanish and French Dolby Digital 2.0 tracks, while subtitles are available in English and Spanish, along with closed captioning. 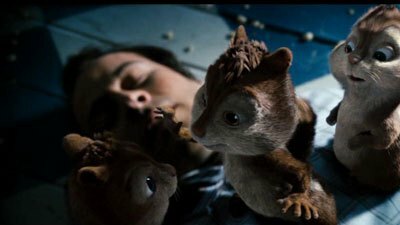 The heavy CGI animation in this movie looks great on this anamorphic widescreen transfer, with the high level of detail showing off the textures of the chipmunks' fur well, while the colors are nicely saturated, showing best on the rodents as well. It's a fine effort all around, and one that's free of any defects or digital artifacts. 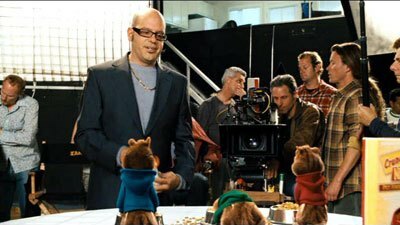 The Dolby Digital 5.1 track should have been more impressive, but it doesn't really get pumping, though the Chipmunks' stage performances raise the level of the delivery. For the most part, the audio sticks to the center channel, and sounds nice and clean, with the surrounds handling the enhancements on the music and some rather minor atmospheric effects. There was nothing noticeable in terms of any kind of dynamic mixing. Slim pickings when it comes to the extras, as each side of the disc has a featurette, though they seem a bit mixed up. On the widescreen side, ostensibly aimed at movie fans, you get a goofy nine-minute piece on making the soundtrack, "Hitting the Harmony." The participants take the work a bit too seriously, though there are a couple of interesting notes shared about how they produced the trademark Chipmunks sound. On the full-frame side, there's "Chip-Chip-Hooray! Chipmunk History" a 12-minute look back at the origins and adventures of the famous characters, featuring an interview with the creator's son, Ross Bagdasarian, Jr. It's the kind of solid, informative featurette that you might not expect to get for a film like this. Things wrap up with a soundtrack promo, trailers for The Seeker and Garfield's FunFest and an "Inside Look" featuring a scene from the upcoming "Horton Hears a Who." I didn't expect to enjoy Alvin and the Chipmunks so I certainly wasn't disappointed, expect maybe in Lee, who should be using his powers for good. On the other hand, my little girl watched enraptured as the furry little guys sang and dance, pointing out exactly who this film was intended for. The film looks and sounds pretty nice, and there are some minor extras, which is more than it might deserve. Anyone who can comprehend that the chipmunks aren't real won't find much of anything to enjoy here, except maybe Cross' silly villain.